About Lee (or my life in pictures) . . . I have been working as a professional photographer since 1980, although my experience and passion for photography go back to early high school in the 1970s. I have done almost every conceivable kind of photography over the years—from editorial to food and fashion, from architectural interiors to studio catalog projects, from special event work to location and studio portraiture. And now, after acquiring Dakota, our brown standard poodle in the fall of 2005, I can add pets to this list. Without a doubt this is the most fun I’ve ever had as a photographer and I’m dedicating the rest of my life to making beautiful images of animals for the people who love them. My editorial experience comes mostly from years of freelancing for USAToday during the 1980s and 90s. During that time, I also worked for some major Washington news magazines, which afforded me a very diverse range of assignments, including covering the White House. I was the principal photographer for a book on the Supreme Court, and I photographed the Liberace estate in Las Vegas for Christie’s auction house. I operated out of a commercial studio during much of that same time, shooting mostly catalogs and ads. As all photographers do, I worked on my own personal projects, like this photo of my brother Mark and these early portraits of my son Ian and my daughter Audrey. AOL was one of my earliest clients for digital product photography, and they were the start of my fascination with web design. The commercial work eventually became the largest portion of my business and each successive studio grew in size until 2000, when I consolidated my photography, Photoshop, pre-press and web design business into an all-in-one studio located throughout my Alexandria, Virginia home. During the years when I largely put photography aside, my photo work evolved through the computer. Most of my time was spent providing digital pre-press services; manipulating, color-correcting and alteration, restoring or otherwise enhancing digital files; scanning; and researching stock photography images. But while this experience initially took me away from the camera, it gave me the skills I needed to do what I do now. It’s the rare pet photo that can’t be improved just a bit by removing something here and adding something there. The trick is to make the process invisible to the viewer, so all they see is the pet’s beauty and personality shining through. In 1989 I married Donna Sicklesmith, a graphic designer I met through mutual artist friends. Donna is now my studio manager, and she designs all our promotional materials including our website. I continue to document our children as they grow up. Here is a portrait of Donna with Ian, 14 and Audrey, 11. This December, for the fourth time, I will be the photographer for the Animal Welfare League of Alexandria’s “Photos with Santa” weekend at The Olde Towne School for Dogs. This 3-day charity event benefits the AWLA, and it always coincides with Alexandria’s Scottish Walk festivities. It has been my pleasure to photograph over 300 pets at this event each year, aided by the master—Carlos Mejias, who has owned OTSFD for over 35 years. I hope Carlos and the AWLA continue to invite me to work with them. I look forward to seeing many of you there. I hope you have enjoyed looking over the various images on our website. 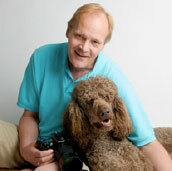 Please e-mail me at lee@photolee.com and let me know what you think of the pet photography you’ve seen here. We always enjoy hearing from other pet owners, especially when you take the time to tell us what your favorite Anderson Photography images are. We look forward to meeting many of you in the future as we work together to make memorable images of your pets.